The guitarist/vocalist for Alter Bridge and former Creed band member takes a break from the stage to talk some baseball with fans. It's time to rock the summer. What’s up, everyone. First, I want to talk about our appearance on WWE Monday Night Raw. We had an incredible time and everyone we spoke with that was associated with the WWE could not have been cooler. They are truly a class act company. After we got there we shot some backstage footage with Edge, who actually uses one of our songs, Metalingus, as his entrance theme. A bit of chaos ensued when Todd Grisham interrupted us but I am happy to report that none of us got hit by any flying chairs or anything. We also met John Cena, the World Champion, and he commented on the Boston Red Sox hat I was wearing. Turns out he is from Boston and is a Red Sox fan as well. **** yeah. We were then brought up to our skybox to watch the show which was very entertaining. I tell you what, I have all the respect in the world for the wrestlers and I could not believe the pounding those guys were taking. Edge had a brutal match that ended with him and Matt Hardy taking a hellacious fall off the top of the entrance runway. I wanted to see Edge after the show but he was taken away in an ambulance. I’ve been trying to call him for the last two days but have not been able to get ahold of him so I hope he is all right. What does all of this have to do with baseball you may ask? We’ll, I’ll tell you. You see, I would never have met Edge nor anyone on the Red Sox, for that matter, if it was not for one man….. Dale "the Demon" Torborg. Most of you probably know his dad, Jeff Torborg, who is a former MLB catcher as well as a MLB manager. Dale is one of my closest friends and is one of the coolest guys you will ever meet. He also has lived around MLB his entire life. He always tells me stories about growing up in MLB clubhouses. Playing whiffle ball with George Brett in the clubhouse between innings, running around with Ken Griffey Junior as kids, stuff like that. I always told him that he should write an autobiography. Dale played some minor league ball but had to stop when he blew out his knee. After that, he taught Madonna how to play ball for the film A League Of Their Own. Pretty cool. He then began wrestling in WCW under the name The Demon. It was in WCW that he met his wife Christi who also wrestled under the name Asya. The two of them just had a baby girl about a week and a half ago. Dale loved wrestling but I think baseball always remained in his blood. After he left WCW he worked with his dad as the strength coach for the Montreal Expos and, after that, the Florida Marlins. He is currently the strength coach for the entire Chicago White Sox minor league system. Actually, he called me up two days ago and told me that the MLB coach was either sick or injured and that he was going to take over in the majors for a while. I highly suggest that the opponents of the Chicago White Sox tread lightly. ******* off the Demon would be bad. Very bad. Haha. Bottom line is that I would not know half of the baseball players I do nor would I be a fan of the Red Sox if it were not for Dale Torborg. Anyways, thanks again for all the comments everyone. I’m reading all of them and I hope to answer some more of them early next week. I just wanted to let you all know that myself and the rest of my bandmates in Alter Bridge will be appearing on WWE Monday Night Raw tonight. It airs on Spike TV at 9:00EST. I do not know what I will be doing on the show but they want me there early to tape some backstage footage. Hopefully that will not include a chair shot to the head. Come back here tomorrow and I will talk about my experience as well as talking about some baseball. I’ve been reading the comments all of you have been leaving and I figure if you have taken the time to write them then I should take the time to answer them. So here we go…. hahaha, it’s funny because there are like 9 different promo shots for either strings or PRS or just Creed in general with you wearing that shirt. Yes, I was not lying. That shirt promoted MLB as much as it promoted PRS, my strings or my former band. I wish I still had it. Great story Mark!! I had no idea you were such a huge baseball fan. Congrats on your new boy!!! I am a new dad as well, my son was born on July 21st. Your wife Victoria may remember me from the PRS 20th anniversary party and the California Speedway show. Whenever I had the chance to meet you I would let her know that my wife was pregnant as well. Thanks for making great music and the great guitar workouts from Guitar One!!! Hey Johnny! Congrats on your new baby boy. It is definitely a blessing. Thanks for checking out Guitar One. If you enjoyed that I will be doing another lesson that is a little more in depth around November for Total Guitar Magazine. I’m actually on the cover right now in both mags so check out the links provided. Best of luck with your guitar playing and your newborn son. I want to challenge you!!! I’m da ping pong master!!! mwuhahahahaha. Come on and face me with your pingpong racket! Hey Lee. Usually I’m a nice guy and I don’t talk smack but if you challenge me in ping pong you will be left with circular welts around your torso from my forehand smash! Maybe one day we will meet, and you will meet your doom! Be careful, the last person who said that got a pong beating at Johnny Damon’s BBQ. Hello Mark, I am not too familiar with Creed as I am pretty much an oldtimer now. I thought I read where Creed were originally a religious type band. Then I hear some of the stuff on one album my niece played that was anything but religious sounding. Maybe I have Creed mixed up with another band Could you comment on this? Hi Bill. Actually Creed is my former band and I now play in a band called Alter Bridge. We got asked that question alot in the Creed days and our answer, still to this day, is that we were a rock band without any kind of agenda. Our lyrical content just happened to be mostly positive and it did not have any questionable content. So I guess you could say we were good for the whole family. Check out our new CD, One Day Remains and let me know what you think. thanks for sharing these great stories mark and congrats on your newborn. please release one day remains and start rising on the charts. been to four of your concerts and love you guys. keep kicking ****!!!!!!! Hey Greg. Thanks a lot! We’ll always do our best to keep the live shows interesting for people like you who come to many shows. We are always adding in different covers and maybe this fall we’ll play some new songs that you may hear on our next album. See you out on tour! Cool, its nice that you take time to inform your fans, appreciate it. Also i got tickets for your UK Manchester date later this year….so **** excited!!!! Thanks Mr. or Mrs. Hobo. Manchester, England is one of our favorite places to play in the UK. See you in November. Hey Mark, Awesome stories dude. Got any Blue Jays related ones? Take care Man, looking forward to seeing alter bridge again at the London Astoria in november. I’m friends with David Wells who was on the Blue Jays. Dave actually brought one of his teammates at the time, Alex Gonzalez, to my house down in Orlando. I actually got to see Alex play(he’s on Tampa Bay now) when I went to see Grimsley play in Tampa. Looking forward to seeing you at the Astoria in November. God, I love how you always mention the BoSox. Come back to the Avalon soon! We love to play in Boston. We have probably played there as much as we’ve played any other market in the world. 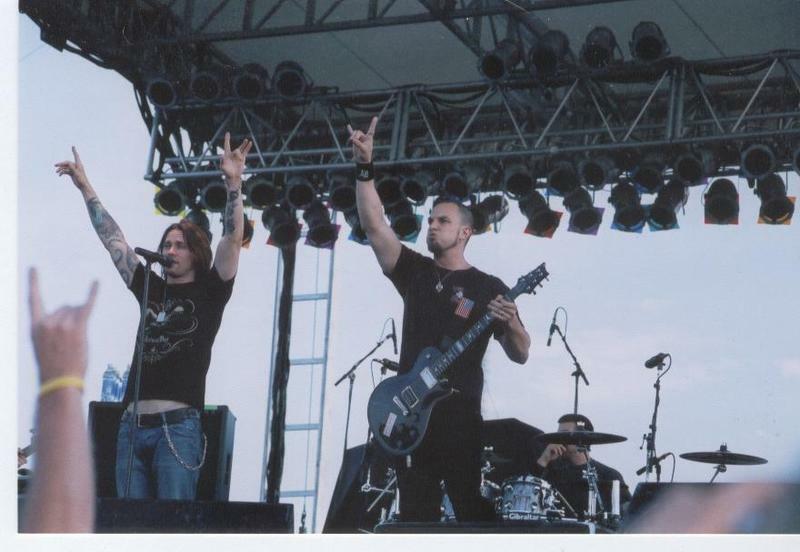 Keep an eye out for us next time and you may see a Red Sox/Alter Bridge reunion up on stage. Hey Brian! Good to hear from you! Long time no see. Sweat, blood and rock and roll is my life. Actually, now my life is vomit, drool and dirty diapers but I would not have it any other way. Thank you very much for taking the time to put that site together, it’s awesome! Well, time to change another diaper. Thanks for the comments, everyone. I wish I could get to more of them. Sign up and keep them coming! Beloit Riverfest, 07-16-05. Photo from alterbridgeband.net. Why My Old MLB Shirt May Attack You! Hey, everyone! Sorry about the lack of updates recently but between raising my newborn son and rehearsing with Alter Bridge I have not had a spare moment. I actually typed up a blog entry earlier this week but as I went to preview the post my laptop glitched and I lost the whole thing. My laptop came dangerously close to becoming a flying projectile. Haha. 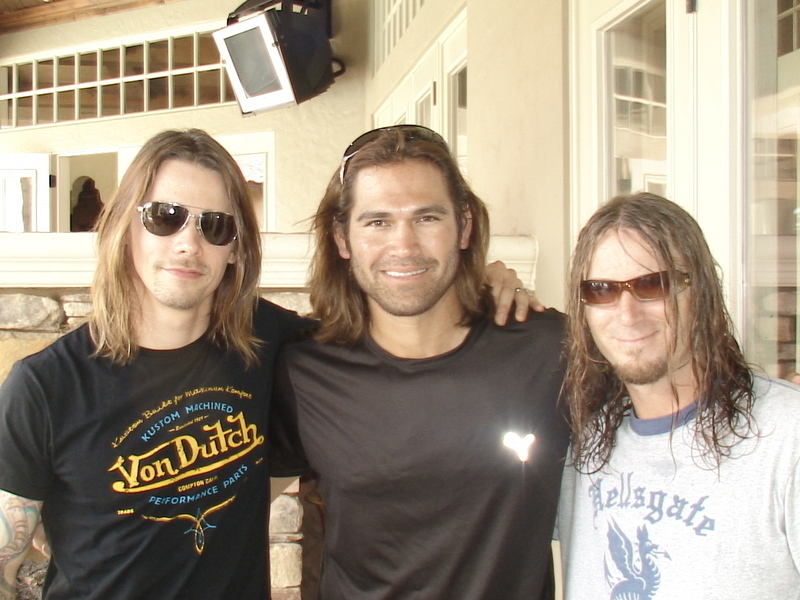 Anyway, in my last blog post I spoke about going to a BBQ at Johnny Damon’s house in Orlando. He lives just four houses down from me. I was able to go but was only able to spend about an hour there due to family commitments. Regardless, it was great seeing Johnny again and good times were had by all. My brother, Michael took a picture that I thought you all might like to see. I’m not in it because it was taken after I left but it includes Alter Bridge’s bass player extraordinaire Brian Marshall (right), our singer Myles Kennedy and Johnny himself. Johnny and I were talking about the Red Sox which got me to thinking about Bill Mueller and the MLB shirt that he gave me. In order to do this we will have to backtrack to the Creed days, more specifically the Human Clay tour. We were all invited to Pac Bell Park by Jeff Kent. Before the game he brought us all into the clubhouse to meet the players. I met most of the players and before I get to Bill I want to give a shout out to J.T. Snow. I heard that during a nationally televised FOX broadcast two years ago he was asked what one of the coolest non-baseball moments in his life was. He said it was hanging out with all of us. I was absolutely humbled when I heard that. So if you are reading this, J.T., please know that the feeling is mutual. You are and always have been one **** of a ballplayer. I met Bill Mueller in the weight room when he was working out. He and I talked for a while about baseball, music and working out. During the conversation I asked him where I could get one of the shirts that he was wearing. It was a black, MLB logo sleeveless t-shirt. He told me that he would get me one and I thanked him. After a few minutes he was like " hey man, I’ll just give you the one I’m wearing." He then took it off and handed it to me. The guy gave me the shirt off his back! Bill, my friend, you are a class act and a gentleman. I wore it on stage the next night at our San Francisco show. After I had it washed first, of course. Ever have a shirt that fits you so perfectly that you wear it all the time? Well, this was that shirt. I think I wore it just about every night from that point forward until the end of the tour which was about a year later. By the end of the tour the shirt was so beat up and worn out that I had to retire it. Not to mention the fact that my other band mates would tell me how it could stand up by itself in the corner. I recently tried to find it but I could not. It may have become a living entity after one year of sweat, blood and rock and roll. So beware! If you see a sweat crusted, black MLB shirt slowly creeping down the street, its mine. Call the hazmat team and run away! Hey, make sure you blog along with me, too — you read mine and I’ll read yours. There’s a 30-day free trial here so get your MLBlog and pick your favorite team and post a comment here to let me know you’ve signed up! 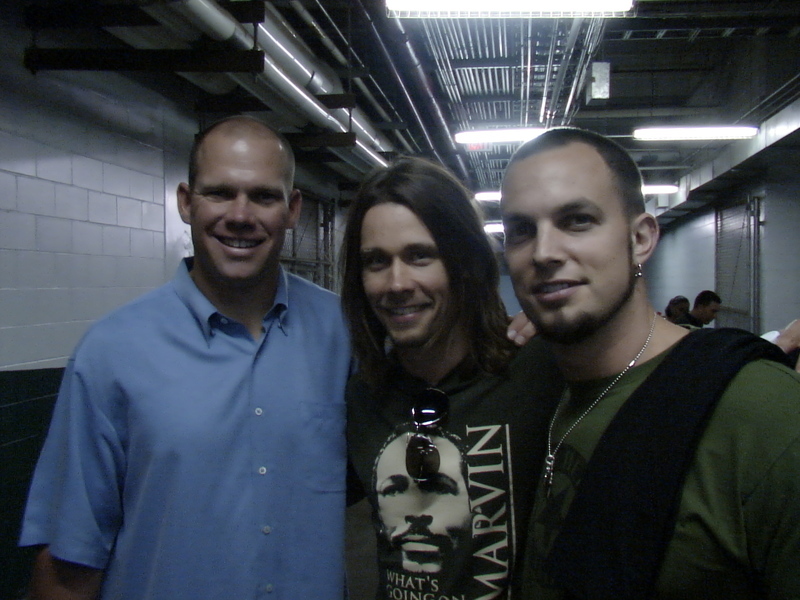 Hello again baseball and Alter Bridge fans. Mark Tremonti here. I know I promised some David Wells stories in this installment but I had a surprise visitor last week and I thought I would talk about that since it is baseball related. Oddly enough, less than 20 minutes after I finished my last blog entry, Jason Grimsley called me up out of the blue and told me he would be in town for the weekend because the Orioles were playing the Devil Rays. The games were on Friday, Saturday and Sunday and he told me he was arriving on Thursday so I invited him and his family to come up to my house in Orlando. I had not seen him since we played a show in Kansas City a few months ago so I was very excited to see him again. He and his family arrived late afternoon on Thursday and his kids made a beeline for our pool. It was not long before Jason and his wife, Dana, were in there with them laughing and having a great time. I couldn?t help but to watch and smile. My wife and I recently had our first child only two months ago and watching his family splashing around in the pool had me thinking of my future with my son, and I hope that I can be as good of a father as Jason is to his children. After that Jason came with me to our practice facility and we tried out some new material on him. We cut the session short because we all wanted to go out to dinner but when we got back to the house Myles(our singer) and I had a song idea so we sat at the kitchen table with acoustic guitars and jammed out for about an hour. Jason sat and watched the whole time. I kept asking him if we were boring him but he said he loved watching the song writing process. We all then grabbed our kids and had a great time out at dinner. Next, it was my turn to be Jason?s guest on Sunday as the Orioles played the Devil Rays. I went with Myles, his wife Selena, my brother Michael and my friend Vince. Jason told me to call him as soon as we reached our seats but before I could, I looked down towards the Orioles dugout and he was down there waving for me to come down. As I was making my way to him I was greeted by none other than **** Vitale. I shook hands and had a nice conversation with him and then continued over to Jason. When I got there Jason proceeded to introduce me to a bunch of the players. It was a real thrill meeting Rafael Palmeiro. I know that he just reached the 3000 hit plateau and he has always been one of my favorite players to watch in this last decade. Rafael was very kind and accommodating. I also met Sammy Sosa and Miguel Tejada for the first time and both were very cordial as well. It was pretty cool talking to three future Hall of Famers. I feel that both Palmeiro and Sosa are locks for the Hall and I think that if Tejada stays consistent he will make it as well. We all had a great time at the game itself. The highlight, for me, was being able to see Jason pitch again. He pitched in the ninth and although the results were probably not what he wanted he gave it his all. As I said before, the guy is an absolute warrior. I don?t think too many people have come back from his surgery in that quick of a time. It just shows his guts and determination. I stopped by the clubhouse to see him after the game and I could tell he was not happy. It made me sad to see him like that and I did not know what to say. It turns out I did not have to say anything. He said, ? I?m going to stay in this mad zone for about another 45 minutes till I get on the plane and then I am going to forget about it and concentrate on the next game?. That?s why I admire Jason. I think he shares the same outlook on life that I do. Do your best each day and when the day ends, concentrate on making the next day your best. That?s exactly why we titled our first cd One Day Remains. That?s how we all live our lives. Well, that?s it for now. Johnny Damon called and said he will be in town this week as the Red Sox are playing the Rays. I?m sure we will probably cross paths at some point. I?d love to make it to one of the games but I am not sure if I can because I do not want to miss another night of songwriting. I?ll check back with you all later in the week. What’s up, Major League baseball fans! Mark Tremonti here from the rock band Alter Bridge. First off, I want to thank MLB for letting us play the Home Run Derby (we had an incredible time) and for letting me share my thoughts with all of you in this blog. Since this is a baseball site I thought I would share some of my baseball stories with all of you. The first memorable baseball experience in my life that really brought me into the baseball world as far as knowing some of the players happened in New York at Yankee Stadium. I was on tour with Creed at the time and we were asked if we would like to take batting practice. We all were very excited and said yes right away. If I remember correctly, it was set up by one of the trainers but not ok’d by the higher ups, as I will get to later. So, we are getting ready to walk out on to the field and as we walk by the managers office I see Joe Torre peer out of his office with a look on his face like "who are these guys waking through my clubhouse". We continued to walk out on to the field and watched the guys take batting practice. It was awesome. When it got to be our turn Jason Grimsley walks over and starts talking to us. He was actually on the disabled list at that time but we did not know that. I began to talk to Jason and he told me that he was a big fan of the band and that he would like to pitch batting practice to us. I said, **** yes, and away we went. I think Scott was the last one up when suddenly Joe Torre comes steaming out of the clubhouse, screaming at Jason at the top of his lungs. He was saying…"I don’t give a bleep who these guys are, get them off of my field." I think we got Jason in some pretty big trouble and it turns out we were ok’d to do it but no one told Joe apparently. He was pretty furious about it but the bottom line is that we got to do it and I’m glad we did. Hey, I’m a Red Sox fan anyway. Haha. Jason and I still laugh about it to this day. He told me he got reamed pretty good by Joe because he was pitching to us while still on the DL. Jason Grimsley and I became very close friends and we are still close, in fact, he is one of my best friends in the world, baseball or otherwise. Anyways, it was a very unique experience and I am still glad we got to do it and by the way, I came within three feet of jacking one out to center field! Just kidding. Also, Jason has just gotten off the DL this week and pitched for the Orioles. The guy is an absolute warrior. He had the Tommy John surgery and came back in half the amount of time it takes most people. He is happier than he has ever been and pitching in the mid nineties again. Kick some ***, my brother, you know I am rooting for you! I’ve got to run because we just got off a two week festival tour and all our gear is getting dumped here in Orlando at our practice facility. I’m on my way there right now to get together with the band to write some new material. We are going to do that for the rest of this month and most of August. We are going to begin touring the states again in late August or early September. Check alterbridge.com for the latest dates. Also, sign up for the forums on alterbridgeband.net. It is a site run by fans that is awesome. My brother updates the forums with all the late breaking news. They also have a wealth of pictures and live video that you can check out. See you all soon and maybe next time I’ll tell some of my David Wells stories. Or at least the ones that are fit to print! 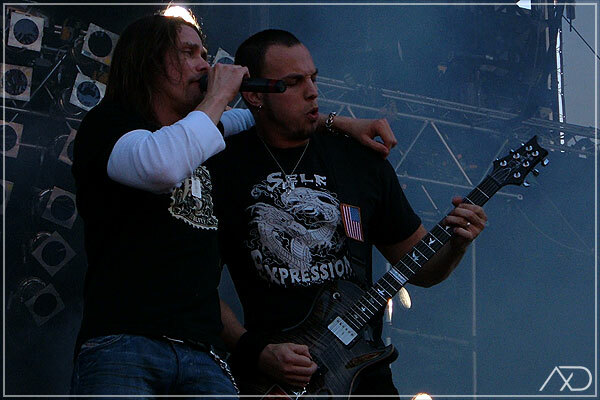 Myles Kennedy and Mark Tremonti at the Fields Of Rock in Holland. neverrainning@aol.com on WWE Raw Tonight!